They made it look so effortless on the TV series, The Love Boat--that is, getting married at sea, perhaps spontaneously after a quick on-board romance. But in real life, it doesn't work quite that way. A wedding at sea can require hours of preparation, mounds of paperwork, and an unflagging sense of humor. 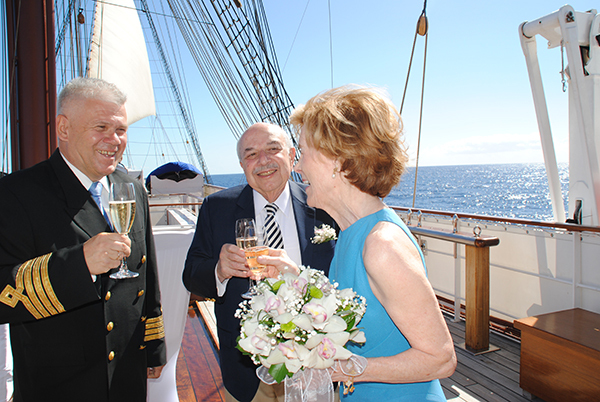 But the rewards are well worth it, according to Doris Price Lerner and her new husband, Norm Lerner, who recently said "I do" on the Atlantic Ocean off the coast of Spain, aboard the quintessentially romantic sailing vessel, Sea Cloud II, of Sea Cloud CruisesTHC. Sailing and the ocean are a huge part of this couple's life, and perhaps more than a little saltwater runs through their veins. They live in Annapolis, Maryland, home of the U.S. Naval Academy--in fact, Norm recently taught economics there as an adjunct professor. And Doris, who works for the Environmental Protection Agency in D.C., is an active member of "Knotty Girls," the women's sailing group of the Annapolis Yacht Club, where the two held their reception several months after their May 22nd marriage. We thought it would be fun to hear about the on-board wedding ceremony from both the bride and the groom, who admitted to having different perspectives on the event. Here, then, is the "He Said--She Said" of their unique wedding at sea. Doris will remember many more details of the story, but we actually did the planning somewhat collectively. We knew we wanted something different for our wedding, and quite honestly, it was getting difficult to get a minister and a rabbi together at the same time for a local wedding. So I thought, "What the hell, let's get married on a ship!" After doing a little research, we settled on Sea Cloud II, which is owned by a German company but flies under the Maltese flag. There was so much paperwork involved, because we were getting married offshore and under the auspices of a foreign country. It took hours--thankfully, Doris deals with this sort of thing more in her job and handled most of it. After everything I signed, I'm not sure, but I think I may be a citizen of Malta now! I've never liked the whole floating hotel concept, so I said, "If we're getting married on a ship, it's going to be a sailing ship." And this ship is amazing. It has gorgeous woodwork everywhere, and they upgraded us to a beautiful stateroom with a fireplace. The captain, whose name is Evgeny Nemerzhitskiy--don't ask me to pronounce that--is from Estonia and was formerly with the Russian Navy. He was a great guy, really fun, and we enjoyed some good conversations. The crew was absolutely magnificent. They couldn't do enough for us. There also was an outstanding pianist on board who performed a couple of classical concerts on the ship's Steinway baby grand--Zuzanna was fabulous. We traveled with another couple, good friends Joyce and Charles Silverman, who stood up for us. We had to wait until we'd left port in Cadiz, Spain, and were outside the 12-mile limit that defines "offshore" before we could begin the ceremony, which was performed on the private captain's deck. Funny story: At the last minute I realized we needed music, so I asked Mario, who plays his electric piano at cocktail hours, if he would play for us. He was great! Doris wore a special blue dress that perfectly matched the blue of the sky--she looked terrific! Of course, everyone present, including the captain and a few crewmembers, toasted our vows with champagne, and then more champagne. I had more champagne on that trip than I've had in my entire life. After the ceremony, they served us a private wedding dinner in the library, which the chef prepared for just the two of us. We wanted to do something special for the captain, so I gave him a beautifully photographed book about Annapolis and the Naval Academy as a gift, to put in the ship's library. I think he was pleased--and we couldn't have been happier ourselves! Ever since reading the marvelous article that [Hideaways President] Michael Thiel wrote, I've wanted to take that same cruise aboard Sea Cloud II. [Read Mike's article at www.Hideaways.com/travelseacloud.] Our friends, Joyce and Charles, had been on Sea Cloud II in 2007, so they highly recommended it as well. We wanted something meaningful, and we knew this certainly would be. I also wanted to choose an itinerary that had plenty of time at sea--for me, it was more about sailing and enjoying the ship than spending time in port. I'd heard from others how difficult it is getting married in Europe, and it was maybe even more difficult getting married there at sea. We weighed the option of having a civil service in the U.S. and then a celebratory wedding on board the ship, but we really wanted the authentic wedding at sea-- and we didn't want two anniversary dates! So I tackled the paperwork. The forms were somewhat daunting, and then they wanted our birth certificates (with Apostille authentication), our previous marriage certificates, and the death certificates of our late spouses--and all had to be certified copies. We even had to have a lawyer's signed statement that we were "free and clear" to marry again! All in all, it must have taken 20 to 25 hours of paperwork and planning, and then the cost--oh my word! I will say, for everything we got, the Sea Cloud wedding package is a bargain at €2,000. The cost of the cruise itself is separate, of course, but the package included so many personal touches. For instance, Norm wanted his bride to carry white orchids, and Elizabeth and Lisa, the ship's hotel manager and cruise director respectively, were able to find beautiful white cymbidium orchids in Malaga before we left port--just what I wanted. Then the cake! Norm and I don't like a lot of gooey frosting, so the chef made us a delicious chocolate cake with raspberry filling and a light layer of frosting. Perfect! To top off everything else, we were upgraded to one of the ship's suites at no extra cost. It was absolutely incredible, with actual windows, not just portholes, and a fireplace, sitting area, king-size bed, a magnificent closet, and marble in the bathroom, with sconces that looked like they were finished with Lalique crystal. What a wonderful surprise! The ceremony was at 11 a.m., so at 10 a.m., Deborah, the spa manager, and Susanne from housekeeping came and escorted me up to one of the Owner's Suites on the Lido Deck, where they offered to help me with my makeup and any finishing touches to dressing, and just generally helped calm me down. Then they escorted me to the captain's bridge for the ceremony. Both women were wonderful about taking care of me. I have to say, I felt like I'd stepped into another era as I stood there taking it all in, the beautiful setting and this incredibly romantic sailing ship. Every detail was perfect and very personal, the crew was so helpful, and the captain couldn't have been more personable. He really seemed to enjoy marrying us. Our wedding day ended with our special private dinner of Dover sole with saffron foam, tomato and basil soup, and a dessert of apricot tart with crème fraiche, all perfectly prepared by the chef and served in the library at the very bow of the ship. Our last night on board, a crewmember came to us and said, "The captain would like to see you on the Lido Deck." We thought everyone was being invited, but it turned out that the captain and several crewmembers had gathered to present us with a special certificate of marriage they had created for us. At the time of our ceremony, we had made a point of asking the captain to note the latitude and longitude so we could incorporate them into our wedding announcement--and there, on this certificate, they had recorded the lat-long for us as well. What a thoughtful touch! I have to say, the ship's crew certainly has won us over. We couldn't have asked for a more perfect wedding day--and we will definitely be going back for another cruise aboard Sea Cloud II! Hideaways worked closely with the Lerners on their cruise and travel arrangements. We specialize in helping members realize their most special travel dreams, whether on land or at sea, and make sure they get special VIP treatment. Call us at 800-843-4433, or e-mail ts@hideaways.com when you start planning for any romantic escape, multi-generational family trip, or exotic adventure.